Device Speed Test is a new app available in Cydia which lets you test the speed and efficiency of your iPhone, iPad or iPod touch, whilst also recommending what you should do to improve performance in simple ways. It also gives indications whether the performance and speed of your device is good enough, giving a green light for good, yellow when decent, and red when slow. Device Speed Test tests the speed of your device. It tell you how your devices are performing in various different operations in seconds and tells you if this is good (green), decent (yellow), or very bad (red). It will also tell you what you can do to speed up your device. 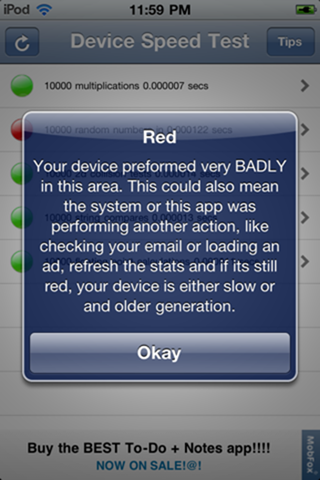 This app would be very useful for iPhone 3G owners, and to a lesser extent iPod touch and iPhone 3GS users. Its free, so why not try and see if it can help improve the performance on your device. You will, of course, need to have a jailbroken iPhone, iPad or iPod touch to install it. Follow our step by step guide to jailbreak your iPhone, iPad or iPod touch with Limera1n or GreenPois0n if you haven’t already. 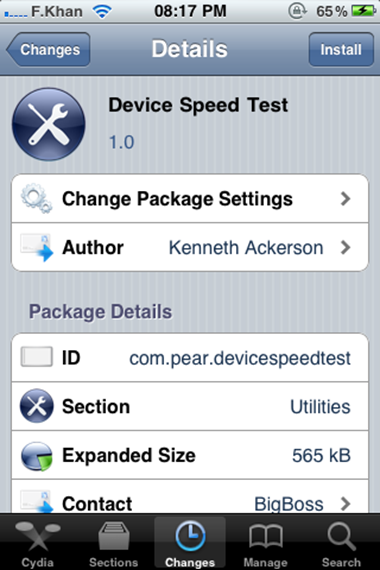 Device Speed Test is available from Cydia for free under BigBoss repository.